And so an Icon is born. It’s all James Cagney in this early Warner’s feature coming on the heels of Eddie Robinson’s breakout in Little Caesar. According to what the history books tell us, Cagney was enlisted to play the second lead but in the end, William A. Wellman cast him in the title role of Tommy Powers who would rise to prominence in the roaring twenties during the age of prohibition. Bringing in the Platinum Blonde herself, Jean Harlow, only adds to the films place in movie history. 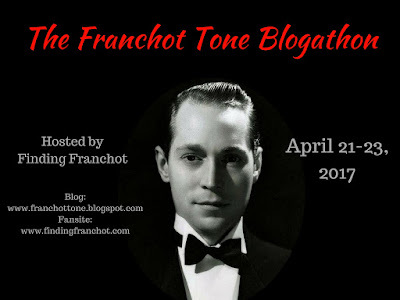 The story spans from 1909 into the 20’s beginning with Cagney and pal Edward Woods as kids enacted by Frank Coghlan and Frankie Darro. It’s hard not to notice that Cagney’s stand-in is an extremely tall child towering over Darro while Jimmy himself not the tallest of leading men. They’re troublemakers headed for a life of crime in the fashion of the eventual Dead End Kids that Cagney would spar with before the end of the decade. 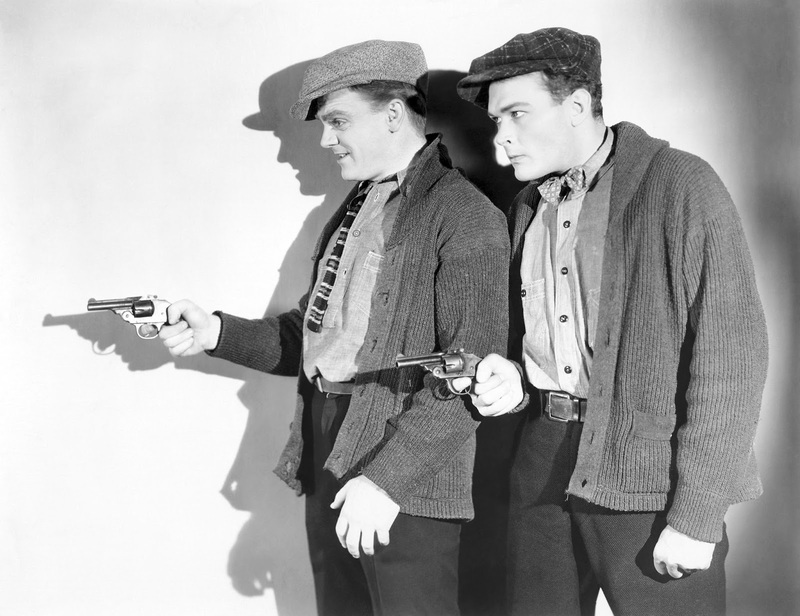 Time will pass to 1915 when Cagney and Woods assume the roles and it won’t be long before a local hood puts a gun in their hand and a heist gone wrong ensues. Once 1920 arrives the boys get involved with Paddy Ryan and Nails Nathan(Robert O’Connor and Leslie Fenton). It’s the dawn of prohibition and the two pals are about to become high rollers. Much to the disappointment of Cagney’s older brother returning from the battlefields of WW1 played by Donald Cook. 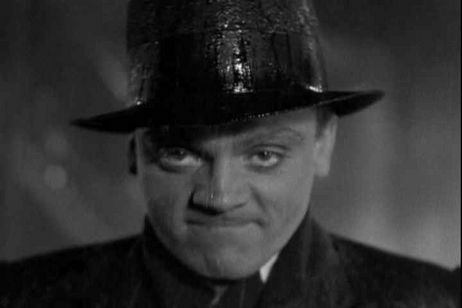 Cook will serve as Cagney’s conscience for the balance of the film. Cagney and Woods hire on as the muscle for Nails forcing their bootleg beer on local speakeasy’s. Along with guns, money and booze come dames and Cagney at first finds Mae Clarke leading to the now famous grapefruit in the face scene that is perhaps his most famous along with the “top of the world Ma.” speech from White Heat. Following Clarke is Jean Harlow who hooks Cagney with her good looks and gowns to match. 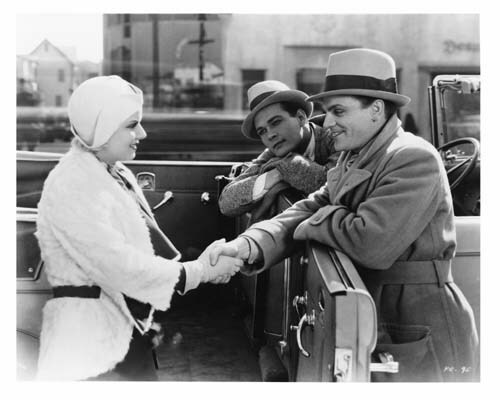 The sexual innuendos begin as the two verbally spar from the moment Cagney offers her a ride. Also in here is a regular Cagney costar during the early 30’s, Joan Blondell, who is cast as Woods’ girl. When a gang war develops over who’s going to be the top dog in the underworld sales of illegal booze, bodies are going to litter the streets and Cagney in coldblooded fashion is going to deliver his own brand of justice when those close to him are killed. It all leads to a magnificent staged finale from the director. One that has stayed with me for years as I recall seeing this for the first time on a late show ages ago. 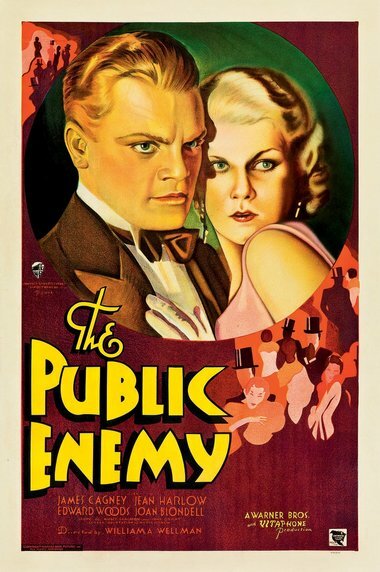 Plenty of The Public Enemy’s footage presents a window to the past as the story often unfolds on city streets and is far from being stage bound as so many films were during the initial run of “talkies.” Cagney delivers a star making performance and it’s easy to see how he immediately became identified with the gangster film at a time when the studios wanted their key players to remain associated with the genre that they first found fame in. Much the same way Robinson did the year before in Little Caesar, Cagney would remain more closely identified as an onscreen gangster than any other character though he was supremely talented and would go on to capture an Oscar as a song and dance man in Yankee Doodle Dandy. With Harlow involved there is plenty of pre-code interest here. Most telling of all in a scene she isn’t involved in when Cagney, in a drunken stupor is seduced and bedded by an older woman only to realize it the next morning in that classic angry fashion he was capable of delivering on camera that left his co-stars trembling. 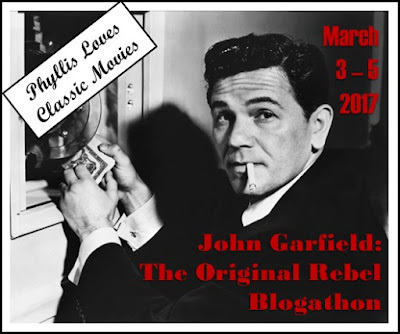 Classic Cagney and a must see for what it represents in the evolution of the gangster film. Makes a fine double feature with my personal favorite of Cagney’s, the 1949 classic White Heat. It’s an opportunity to see how Jimmy aged on camera and matured as an actor. Also to see how the genre had changed in the 18 years between the two Warner Brother productions. If you haven’t yet seen it you should. It’s easy to acquire on either DVD or blu ray so you have little in the way of making excuses. And besides, Cagney probably had little tolerance for excuses so one shouldn’t push their luck. See it! 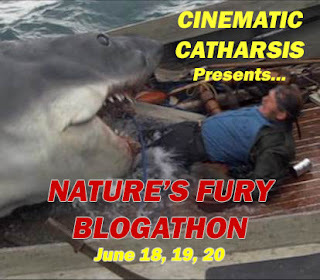 I’ve got this one in a TCM collection, but I haven’t gotten to it yet…sounds like a great one. 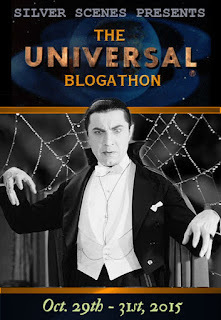 And I love to see what films got away with in the pre-Code era, so this should be a fun watch for that reason alone. You’ll have to squeeze it into the 2019 line up…lol. 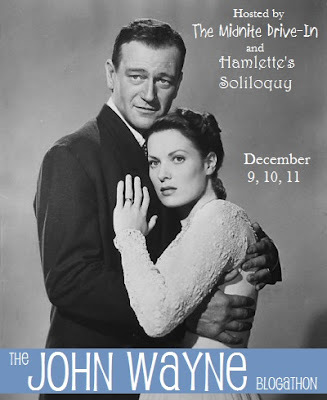 Really is a must see. I was a kid when I also saw it on an afternoon movies of the week type show, saw it afterschool one day and yikes, that ending still haunts me today! As does Richard Wydmark’s scene as bad guy Udo pushing that poor woman in a wheelchair down the stairs in Kiss of Death! I do wonder, though, as to why Widmark wasn’t typecast as a gangster as much as Cagney and Robinson were, owing that all 3 had their first roles in films playing gangsters. I think it took Widmark a few years to get out of the mode overall and even late in life he used to say that he’d always be remembered for that first role as a cackling killer. Love them both on screen no matter the role.